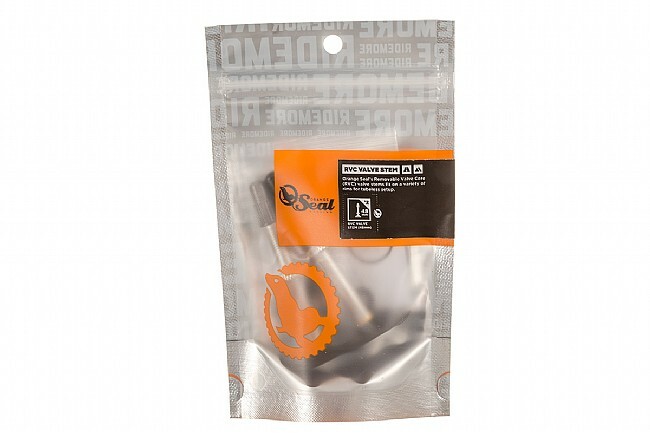 Orange Seal's RVC Valve Stems make setting up tubeless tires easier. With an oversized, trim-able base, these valve stems provide a nice seal for tubeless setups. Their unique design also helps prevent them from pulling through the rim, and each size features a removable valve core. The RVC Valve Stem is sold in packs of two and comes with a lock nut and cap. Available sizes: 48mm, 60mm, and 80mm. These have a wide flap that is inside the rim, but on narrower rims it doesn't sit flat in the channel, and ends up obstructing the tire from seating properly. On wider mountain bike rims it may work better.